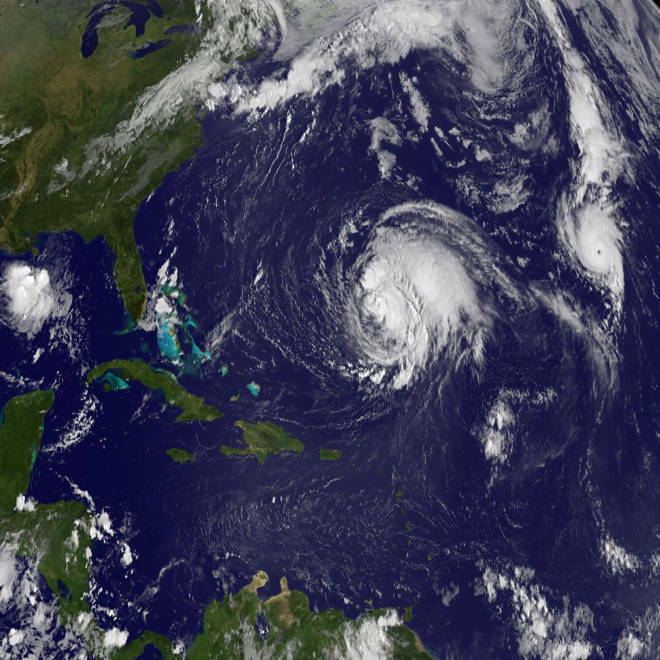 A satellite-based image shows Hurricane Michael, right, and Hurricane Leslie, center, churning in the Atlantic Ocean on Thursday. Updated at 5 p.m. ET -- Hurricane Michael became the first major Atlantic storm of 2012 on Thursday, but by late afternoon had weakened from Category 3 to Category 2. Michael was not expected to make landfall, but Hurricane Leslie was already creating waves in Bermuda. Michael became a hurricane overnight and quickly grew to Category 3 strength with maximum sustained winds near 115 mph Thursday morning. By late afternoon, the winds had weakened to 110 mph, the National Hurricane Center stated, and further weakening was expected. The seventh hurricane of the 2012 Atlantic season, Michael was expected to turn north-northwest with some gradual weakening possible by Friday. Michael is "well removed from any land interests" and is "not a wave generator for the East Coast," Jonathan Erdman, a meteorologist for The Weather Channel, told NBC News. Meanwhile, Leslie was basically stalled Thursday afternoon but still expected to pass near Bermuda on Sunday. Locals on Thursday were already moving boats out of the water. "We still expect tropical storm force winds across the region on Saturday afternoon and storm force winds with hurricane force gusts (on Sunday) as the storm moves north and east," Jeff Torgerson of the Bermuda Weather Service told the Bermuda Sun. "We are still expecting a significant storm," he added, "it’s best to hope for the best and prepare for the worst." A Category 1 hurricane, Leslie had maximum sustained winds of 75 mph, just a mile above hurricane status, and was about 430 miles south-southeast of Bermuda. Leslie is expected to gradually strengthen over the next 48 hours and could become a Category 2 hurricane. Current storm projections show Leslie tracking off the Eastern Seaboard to south of Nova Scotia, Canada, but not making landfall, Erdman said. "Leslie will continue to be a generator of waves along the East Coast, with a rip current threat persisting through Saturday from Florida to New England," Erdman said. Swells generated by Leslie will also impact Bermuda, Puerto Rico and the Virgin Islands "for the next few days," the hurricane center stated.